I grabbed the costume of the mortician dude to get into the church. All I had was my fiber wire and an exploding golf ball. I made it fairly far, getting myself into the same room as the target, but then like three different people recognized me at once and I was summarily gunned down. Sad times. I got in through the morgue then got a priest outfit and started trailing the target to see if I'd get him alone. He eventually went over to some small building off to the side where I could get to a spot where no one could see me. While he was there I threw a knife at his face, hid around the corner while the guards searched then managed to run away and escape on the docks. What are you guys doing for your standard loadout? Right now I start with the either the remote explosive or poison (the other one will be my stashed item), the silverballer and lock pick. I found that the fiber wire isn't all that useful and stopped bringing it. Still waiting on the suitcase W2000 sniper rifle. I am also really starting to get annoyed by the unlocks, I wish you got to pick. I really just want the gear, don't care about stash or starting locations as much. We are excited to announce the release of the Summer Bonus Episode for HITMAN on July 19th. The Summer Bonus Episode will also present a range of new in-game Challenges and Opportunities and an entirely new setting for Escalation Contracts and Elusive Targets. Each location will have a completely different feel when you revisit it. 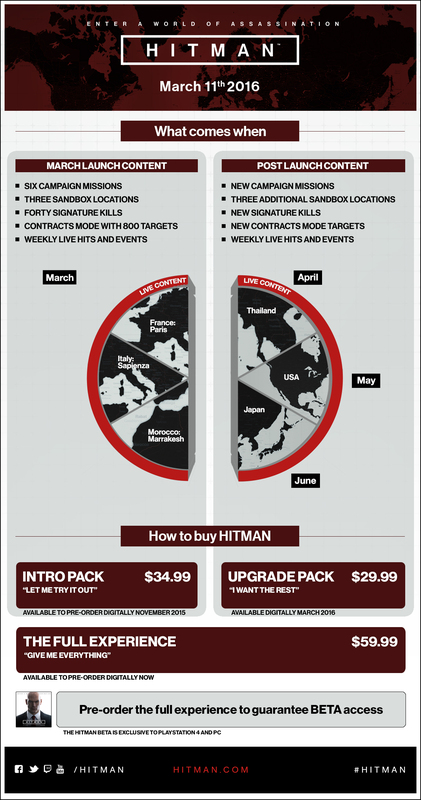 The Icon, set in Sapienza will even have a crazy giant killer robot, which allows us to show what we can do with HITMAN as a live game and it also feels like the perfect midway point of the season before the final three locations; Thailand, the United States and the season finale in Japan arrive later in 2016. We'll be talking more about the Summer Bonus Episode throughout E3. Stay tuned! Those bonus episodes sound cool. So what is the 4th location? Yep Thailand then the US then Japan. I guess I'm confused because they said there would be 7 locations. Are they counting the tutorial? Edit: Just to be clear, not complaining, I've already spent 40 hours playing this game so it is not like it is a rip off or anything, just genuinely don't understand. The 7th episode is a mystery location, right? Is that Summer Bonus thing free or paid? Unclear. Maybe free if you own the level already? I believe it's free if you own the level, yes. You know that schedule is out of date, right? Or was that a goof that just went over my head? Neat, glad this one is in Paris since I haven't finished unlocking Marrakech yet. A dev from the Hitman team was on Giant Bomb's E3 show tonight, talking about a bunch of cool things. Fun fact from the show, the elusive targets, unlike the story missions, have actual randomness. For example, when there was the second elusive target, someone I talked to mentioned how they were able to poison him when he goes to the wine cellar and drinks some wine. I wanted to do that, but I never saw him drink anything when he was down in the wine cellar. Turns out, the reason why is that the Congressman has a 25% chance of actually taking that drink, which is part of the devs trying to introduce some randomness so that poison kills aren't so easy. Yes, it was a goof about how messy the release of this game was. I wonder if we got the "Six campaign missions" of the original intro pack (Paris, Sapienza, Marrakesh) already. Nice, will that video get posted online at some point? http://www.giantbomb.com/videos/giant-bomb-live-at-e3-2016-day-01/2300-11346/ is the video archive of last night's show. I think the Square Enix folks are the 3rd set of guests? Another fun thing from the video is that apparently the clearance rate on the elusive targets has been right around 50%, and the Silent Assassin rate is like 5%. That really, really makes me want to get SA on an elusive target now. I feel like part of that is the risk of something going wrong makes people less likely to try for a perfect hit. I am currently 2/2 of the ones I've tried, One went extremely well, the other was almost a disaster. Not that I noticed, but I am a good bit past the recommended specs.